Don't be fooled by the compact bodies and innocent-looking faces of mongooses. These little creatures are cute, but they're fearless hunters. Mongooses, about the size of small cats, live with their families and offspring in groups of around 20. Mongoose are dedicated mothers to their young, which are called pups. 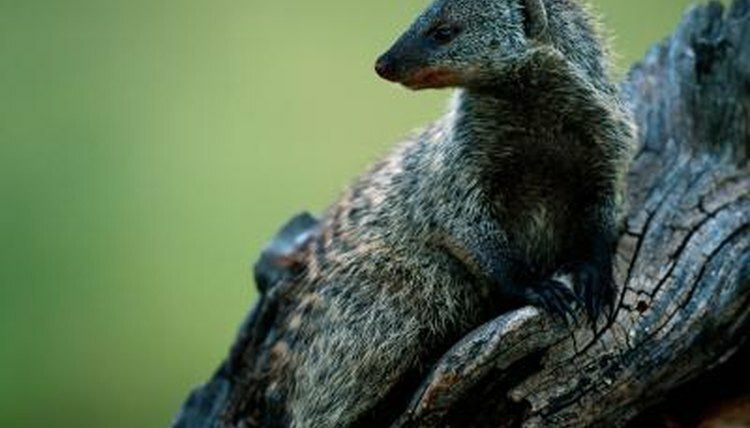 The mongoose population is native to Africa and some parts of Asia. Mongooses make their homes in a variety of settings. Sometimes they live in burrows they create for themselves and their young. They do this by digging holes in the sand large enough to create shelter for their pups and colony. Many times, though, mongooses simply move into a vacated burrow. Some mongooses will live between the crevices of rocks. Mongooses are stealthy hunters and tenacious fighters. Mongooses have been known to pick fights with cobras and other venomous snakes. They aren't picky when it comes to hunting rodents and other small animals -- birds, frogs, reptiles, insects, and worms all make the list. Fruits, nuts, and seeds are also favorite snacks of some species. Mongooses enjoy stealing bird eggs for dinner. They crack them open by launching them against an object with a hard surface. A single group of mongooses will be composed of many females who will breed. Male mongooses living with a group of banded females will form their own hierarchy in which only one or two of them are allowed to mate. One male will father around 80 percent of the pups in the entire group. Sometimes, when too many females populate a group, older females will begin to try to drive the younger ones out of the group. This is common when more than eight females occupy a group. Even already pregnant, some younger females will be sent packing. Sometimes they may be readmitted to the group. Other times, they may join other groups with subordinate males. Mongoose females are well-organized when it comes to the birthing of their pups. Mongoose females will give birth four times a year on the exact dates the other females they spend their lives with give birth. The females synchronize these births carefully because they want to ensure the survival of their precious little ones. Pups born slightly before the joint birthday are at risk of being killed by other females in the group when the early birthing mother is out looking for food. Killing pups born before the group delivery is instinctive; it's a means of eliminating competition for their own pups to survive if resources are scarce. Mongoose pups live tucked away in their burrows until they are around 6 weeks old. Males who are not breeders will guard the burrows, much like babysitters, while the females are out looking for food. At around 1 month old, the pups will learn to forage for food with the help of mom. Older male mongooses will form close relationships with the younger ones, where they serve as one-on-one chaperones. The older mongooses are usually older cousins, siblings or uncles who are not breeders. They will teach the younger male mongooses how to forage and hunt for food, as well as how to defend themselves. The female pups will stay together as a bonded group, sometimes for the rest of their lives.